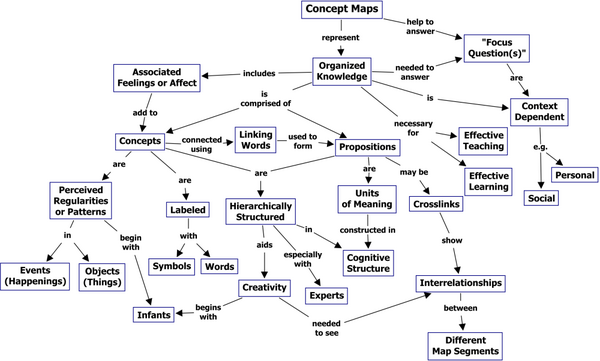 A concept map is a graphical representation of a student’s knowledge of a domain and constructing a concept map provides a way to expose, reflect on, deepen, and share your understanding. A concept map presents the relationships among a set of connected concepts and ideas. It is a tangible way to display how your mind “sees” a particular topic. In addition, concepts are presented in hierarchical manner, the most general concepts on top. In problem-based learning, each student group is like a party of explorers entering new territory. As a group they decide what neighboring areas they should reconnoiter, the individual members scout these areas and return to describe things they discovered that are relevant to the party’s interests. It is important in this process that the scouts know what they are looking for. In this effort, each member learns different things that get integrated and used to make decisions. Not all of the information will be transmitted to the others. When the expedition is over and the party needs to summarize their explorations, they draw a map that captures the important features of the territory. This would correspond to a PBL group constructing a concept map. The instructor or tutor serves as a native guide in this analogy.